Although today's post is the last of this five-part series "Spicing up the Descent Down," it is far from the last post on the trip down the food web. Humans, as uber-apex species of both marine and terrestrial food webs, are biologically programmed not only to try to dominate every trophic level of every web and chain, but also to fight like hell against whatever might force them to accept less, once more has been the daily diet. Instinct drives humans to strive for the best, for variety, for more. The good side of this biological program for more and better is that as we move out of lower needs-levels (see the post Does Eating oysters increase global pleasure? with an explanation of Maslow's hierarchy of needs), as we move from needs dominated by basic survival requirements such as food and shelter to higher (a metaphor and ordering concept but not a judgment) needs of self-actualization and aesthetics, we begin to approach the highest level, which is transcendence (in this hierarchy). Transcendence is conceptualized here as functioning at a level of excellence beyond the needs of self, family, and/or local community (tribe, nation). In transcendence we care for others, for marine species, for plankton. We embrace complexity and interdependence. Humans tend to move in and out of higher levels as circumstances change, functioning perhaps not wholly or all the time but in most cases at times and as one facet of global functioning at the level of transcendence. In and out. Up and down. This series on spices reflects a desire characterizing Homo sapiens apparently more than other species: to have the best possible as much and often as possible and never to settle for less. The best seafood is sourced for the most part from top trophic levels, which are at the simplest conceptualization of levels: plants, herbivores, and carnivores. Trophic levels are defined by who eats whom. Bluefin tuna, as a prime example, is known to be a fierce fighter and voracious carnivore that feasts on herring, hake, squid, and mackerel as primary food choices. Humans prefer the best, and as apex predators, are able to choose to eat what they prefer; bluefin tuna is one of their prime seafood choices. Most top level marine food species are considered superbly tasty with minimal need to spice up.Tuna and other high level predators such a swordfish and salmon, all found in our local ocean waters, when caught and eaten in a matter of hours taste as good as it gets: with the complex, savory, briny, oceanic, far horizon flavors that have enticed humans for millenia. While Bluefin tuna are still fished in the Santa Barbara Channel waters, the species is considered by many ecologists and marine scientists to be on the verge of being fished out, as are swordfish and salmon (See California Dept of Fish and Game review of California Fisheries in 2010). Catherine Kilduff, Center for Biological Diversity reported on June 2, 2011 that Canada's scientists had declared the Atlantic bluefin (Thunnus thynn) as endangered, facing imminent extirpation or extinction. The scientists found the populations at an all-time low, having declined 68 percent over the past two-and-a-half generations. When the bluefin are fished out then humans look to whatever is at the next trophic level, like squid. Since 1993 market squid have been the number one fishery in California. In 2010, market squid, Doryteuthis opalescens, (formerly Loligo opalescens) dominated commercial landings of marine species in California, contributing about 66% of the total tonnage and 41% of total ex-vessel value of all species landed. Although predators still high up in the food chain, squid are--arguably, of course--not as tasty as fresh-caught wild Chinook salmon. hence the non-frivolous nature of this series on spices. 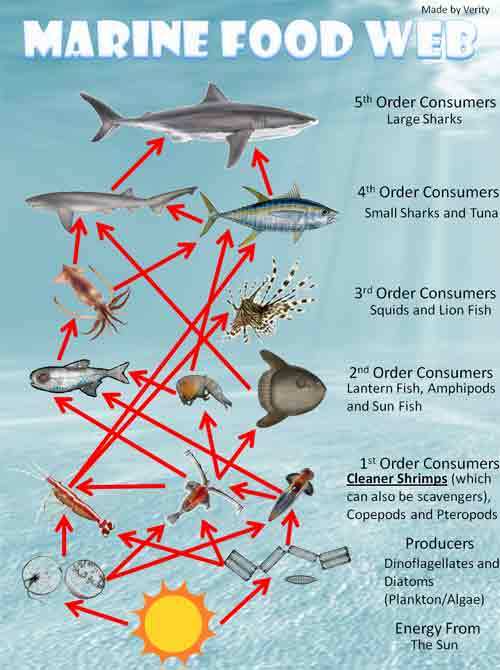 We are eating down the food chain. We will be eating fish that are today considered less desirable that the top level marine predators. We will need to be more discerning in our use of spices if we want variety, since one of the still-in-the-closet-facts of aquacultured sourced seafood is that genetic diversity tends to be inconsistent with industrial farming. Another objective for this discussion of spices from the parsley ( Apiacaea) family is to underscore the importance in ecosystems of even slight differences. The seven spices discussed here (cumin, anise, aniseed, dill, coriander, fennel and caraway) from the Apiaceae family all look fairly similar as growing plants. 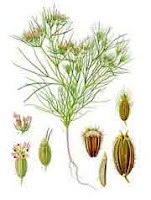 Even their common names overlap: Caraway (Carum carvi) is known as meridian fennel, Persian cumin, French anis des prés, anis des Vosges, cumin des prés and faux anis. While star anise is often grouped with these spices it belongs to a totally different family (the Schisandraceae family) and grows on a tree. While I have proposed cumin as the top spice in 2050, and cumin is also probably the most popular in 2012 of the spices discussed in this series, caraway is probably the most hated. A biennial plant native to western Asia, Europe and Northern Africa, caraway resembles in its growing state all other plants in this spice group of parsley family plants. The seeds are the plant's fruits. The flavor profile is tangy, slightly sweet, a touch of lemon rind from the limonene but the dominant flavor derives fom carvone, Carvone, found naturally in many essential oils, is a member of a family of chemicals called terpenoids and is most abundant in caraway and dill seeds. Carvone is also responsible for the flavor of spearment, which just shows that context is key to judgment. According to Katzer, Caraway fruits contain 3% to 7% essential oil. The aroma of the oil is jointly dominated by carvone (50 to 85%) and limonene (20 to 30%); the other components carveol, dihydro­carveol, α- and β-pinene, sabinene and perillyl alcohol are of much minor importance. Interesting as part of this exercise in the importance of small differences is the fact that carvone forms two mirror images as a chemical (enantiomers):with two very difference aroma outcomes. R-(–)-carvone smells like spearmint and is almost universally considered a pleasant smell. Its mirror image, S-(+)-carvone, smells like caraway, and as mentioned above, caraway if one of the least liked spices in this family. Note: Monterey Bay Aquarium rates albacore tuna caught with trolls and poles in the US pacific and Canadian Pacific as as best choices. These fishing methods catch younger fish with lower mercury levels and are considered safe for consumption. Fish caught with the longline method are to be avoided, as are North Atlantic albacore. 1.Roast first three ingredients on a hot dry skillet till seeds pop and release fragrance. Remove, finely grind along with cinnamon, allspice and grounds. In a blender or mortar combine spices with onions, ginger, black pepper, cayenne, criander, turmeric, and nutmeg. When finely smashed add oil and blend till paste. Rub paste on tuna and marinate at room temperature for 1 hour. Combine remaining ingredients for sauce: yogurt, lemon zest, garlic and half the cilantro. Grill steaks at medium low heat about 8-10 minutes until they flake watching that paste doesn't burn.Spread sauce on a plate, then tuna, then sauce, then cilantro leaves. Serve with Moroccan carrot salad and couscous. 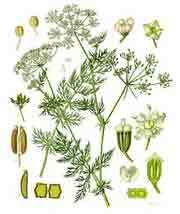 Dill has a milder, less strident flavor and aroma than caraway and none of the negative reputation. Rather, dill is considered aromatic, sweet, somewhere between anise and caraway. The leaves are milder than the seeds, which have pungency. The essen­tial oils from leaves (0.35%) and fruits (2 to 4%) differ slightly in com­position: In the fruit oil, the main components are carvone (40 to 60%) and limonene (40%), but other monoterpenes appear only in traces (phellandrene, carveol, terpinene and dihydrocarvone). In the leaf oil, the aroma is determined by carvone (30 to 40%), limonene (30 to 40%), phellandrene (10 to 20%) and other monoterpenes; dill ether (a monoterpene ether) is characteristic of dill leaf oil.Oil from the fruits of Indian dill (Anethum sowa) contains the phenylpropanoid dill apiole (6-allyl-4,4-dimethoxy-1,3-benzodioxol)." 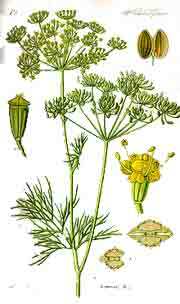 In most countries dill is used with fish. To continue the point that small differences make little difference to most people, in Laos dill is called Laotian coriander.The following recipe using dill would be a suitable accompaniment for a relatively simple unseasoned fish dish like fried market squid or baked tilapia.